is still largely reduced to the twelve years from 1933 to 1945, and why it still seems impossible in Britain to criticise any aspect of German economic or foreign policy, especially on EU matters, without some kind of Nazi connotation or similar historical insinuation lurking somewhere in the background… Why has nearly a lifetime of peaceful and liberal-democratic development in Germany done so little to put the Third Reich into some kind of historical perspective? in a world where practically no one ever agrees on anything except on the facts that excessive bank bonus payments are inevitable, yet also that the financial markets cannot be regulated and that the end of the welfare state is inevitable, where very few shared ethical assumptions exist, everyone can nevertheless still agree that, whatever the disagreements between them, nothing can ever be as bad as what the Germans – a term all too readily used in place of the Nazis – did during World War II. It is a kind of minimal ethical commitment everyone can safely concur with, and one that costs very little indeed. Beck concludes that the “whole machinery of human rights movement” has lost perspective. Whilst the courts have gone about an unimpeded extension of the meaning and scope of many human rights, “unhelpful references to the past” shut down any rational discussion of the interpretation now attached to many rights. For instance, the talk about the need to prevent another Third Reich, genocide or wars, bears little or no meaningful relationship with issues such as whether the right to privacy should extend to abortion or whether there should exist a right to family reunion and fertility treatment, both key issues in current human rights law, both in Europe and the US. In the end, China which has so shrewdly refused to do what Germany seems so eager to do, namely to bail out the eurozone, will mop up what remains in Europe on ebay, and it is unlikely that it will make subtle distinctions between things German and British. We shall all be equal then. I have read – and left a fairly long comment underneath – Dr Beck’s original article (hyperlink above). Like the commentators before me, I do not believe that Dr Beck has produced any worthwhile evidence to support his various claims. What I will say, though, is that there seems to be an unhealthy focus on German history between the 1920s and 1940s which largely concentrates on the rise, rule and fall of Nazi ideology and power not on the part of the UK public or media but on the part of UK examination boards. Quite why this is is hard to explain, though it is clearly ervident that it serves the Zionist project well. Perhaps it is time that the UK examanition boards and the Department of Education insisted on exam boards changing the curricula focus of study to Germany after 1945? It is time we put WWII behind us as forming part of the explanation of the modern world we all occupy now. The original article by Dr Beck typifies the worst of modern lazy scholarship, by importing tired tools of literary criticism into unrelated contexts. His idea that the media write about the Germans as Nazis as ‘The Other’, so allowing the creation amongst those who denounce them of a group identity, is an extremely simple point indeed, which could have been put much more succinctly. Further, his writing betrays an open and depressing ignorance of history, in very many points. Here are a few. He complains about discussions of human rights conventions occasionally referring to Nazism. Perhaps an historical appreciation of the drafting of the declarations on human rights would have made it clear to him that the background of Nazism was central to their very creation. If the timing of the drafting, in the immediate post-war, wasn’t obvious enough, there is the clear reference in the opening of the preamble to the UN Universal Declaration on Human Rights, which reads; “Whereas disregard and contempt for human rights have resulted in barbarous acts which have outraged the conscience of mankind…” Of course Human Rights discussions sometimes refer to Nazism; the international conventions were drafted as a direct response to the Nazis. It’s foolish to pretend that they are not related. Then again, he complains that the words Germans and Nazis are used interchangeably when referring to the Third Reich. It’s very difficult to see how that objection is rationally sustained. 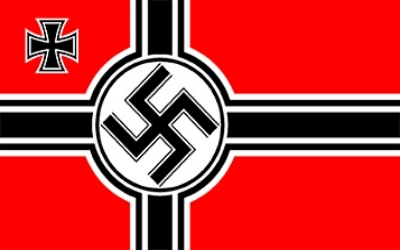 The worst human rights abuses were perpetrated in the implementation of the Third Reich’s racial policies. It’s an uncomfortable truth that, despite the best efforts of revisionist historians to blur the issue, there was no popular, effective, protest against Nazi rule or policy, even in the closing days of the War. The Third Reich aimed to unify the German peoples into one state, at which task they effectively succeeded for the duration of the War. Not all totalitarian regimes of the time followed quite the same policies or commit the same abuses. For example, the Italians did not, nor did Franco’s Spain, although neither regime was to be admired in any respect. The German allies, the Japanese, certainly committed comparable atrocities, particularly in the Chinese theatre. The Germans’ central opponent, Stalin’s Russia, meanwhile, perpetrated if anything worse abuses than the Germans themselves, though Stalin’s behaviour was motivated less by the communist ideology and more by his own paranoia and sheer depravity. All that said, it is very difficult to see what Dr Beck’s linguistic complaint actually is; the actions of the Nazis were the actions of the German state and the German people. Worse, airbrushing the uncomfortable truth that the ‘Nazis’ were actually real flesh-and-blood people, not pantomime villains imported from the ether, is a dangerous act. The human rights conventions were drafted in response to the shocking reality that a cultured, sophisticated people could indulge in such barbarity as the Germans had done. To forget that the Nazis were the civilised, respected Germans is not only counter-historical and ignorant, but defeats the whole point of human rights conventions; simply put: to prevent reasonable people like us from acting like barbarians like them. His attempt to play down the suffering of the British during the war is equally feeble and counter-factual. His leading example of the 105-year-old grandmother (who is presented by way of second-hand hearsay) is absurd. It’s clear that she was born, at the latest, in 1907. That makes her old enough, as a 7-11 year old during the Great War, to have heard the horror stories of her parent’s generation, and to be scarred by that generation’s experience – no-one of her age would have failed to notice the hushed tones in which the adults of her generation spoke of the Great War. She would have been 32 on the outbreak of the Second World War – so of an age to have a clear memory of the suffering. Is it any surprise that a probably senile old lady recalls formative experiences of her childhood and adult life in her illness? Does Dr Beck seriously think that any adult in that period can have been unaffected by the experience of living through the war, especially when they had childhood experience of the first and its aftermath? Does he seriously believe that it was possible for anyone not to have friends, if not relations, involved with the war effort? If he does, then he thinks and believes obvious nonsense, and reveals an ignorance of recent history disturbing in an academic. His other examples, e.g. ‘a barrister said to me once’, reported with all the accuracy of a drunken chat at the back of a pub, are of even less probative value and can be taken about as seriously as Fawlty Towers’ episode on the Germans (which, since I’ve mentioned it, actually portrays the Germans respectfully and a certain British attitude, represented by the Major, as ridiculous). Further, in writing that hostility to Germany in Britain is ‘timeless and unchanging’, he reveals that his understanding of English foreign policy is extremely shallow. Had he any familiarity of nineteenth century politics and earlier, he would know that the Germans, to the generation that fought in the Great War, had been seen as the natural allies of Britain against the military threat of the French, and the German states had occupied that position, i.e. of allies, since Napoleon. Timeless and unchanging? No – changed by the actions of two generations of Germans – which explains the historical importance of that period, and some of the devotion of TV channels to it. Further, by its presence for the past 70 years in Germany, membership of NATO, and joint projects such as the Tornado jet, the British armed forces have worked with the Germans for their defence in a close co-operation. For all of the silly bombast of the tabloids, football matches between Britain and Germany for many years have been played and watched in a spirit that bears no relation to Dr Beck’s lazy stereotyping. To portray the British attitude to the modern Germans as one of simple hatred or bigotry, therefore, as this man does try to, is quite misguided and wrong. The actual reception of His Holiness Pope Benedict, on his visit to London, as opposed to the anticipatory media outcry, was one of friendly welcome. Unexpectedly large crowds turned out in London to greet him. Dr Beck’s reality seems to be one taken wholly from the online press speculation, and is not based on personal observation or after-the-event reports at all. In the mainstream press, the history of the period is able to be clearer in England than it is on the continent, for the simple reason that as only a tiny fragment of our territories were occupied (the Channel Islands), we don’t have the same problem with Nazi collaborators and supporters that plague all other European countries. Further, our history isn’t complicated by any post-war occupation by the Soviet state, so muddying the collective memory of Nazism, e.g. as in Hungary. So our national discourse is unexpectedly simpler than any other found on the continent. How can there be any surprise in this? It is also true that for the generation which lived through it the Second World War is seen as the last time that Britain (and her empire) was a superpower in world affairs; the Suez crisis, end of empire and need to go cap in hand to the Americans just to get by economically showed a new and uncomfortable reality very soon after the war’s conclusion. He also ought to realise that the viewers of the history channels on satellite television do not represent the majority of the country, and in any event at least some of them are quite able to distinguish between a military history hobby or point of interest and how they deal day to day with any Germans they may encounter. Of course, online discussions are of a lower standard (subject to Goodwin’s ‘law’). However, if Dr Beck takes the opinions of the trolls too seriously, so as not to be able to differentiate between the bile of the internet, and serious discussions, then he is confusing himself. Naturally, even serious discussions of human rights are framed by the actions of the Nazi state, which were the actions, the collective will, of Germans. The fact that this is taken too far on a few internet fora doesn’t cause that not to be true. However, he seems to have been unable to separate internet debate from serious discussion. His overall point, making a link between remembering the history of the Nazi state, and the debate as to the financial future of the Eurozone, as has been commented above, is a weak one, and has been confused by his failure to discard the opinions of trolls. Serious financial discussions of how to deal with the Euro crisis have not yet degenerated into accusations of Nazism. An academic should be able to separate the poisonous side of the internet from the serious negotiations which are taking place in and between governments, and his approach, ignoring history, and looking for serious discussions in the wrong places, indicate his weaknesses as an academic. There is a natural tendency to refer back to the reasons why (a) the European Convention on HR and (b) the EU came about. It was clearly sensible to try to prevent, if at all possible, some of the gross abuses of human rights which took place. However, the living instrument doctrine (disliked by many a UK politician) has ensured that the convention has not been stuck in 1952 and, via protocols, the protection offered has improved. As for the EU, the original Treaties of Rome (especially ECSC) came about in order to lock in and control the steel production of places such as the Ruhr. There is little point in looking back all the time and I am not quite so sure that younger people in our country do actually look back to WW2 or before. However, there is no doubt that, when it suits them, the media and some politicians love to hark back to the Third Reich. I suspect that the resignation of non-lawyer Dr P-D from the Commission might have had more to do with him not being one of the “QC club” which the commission is. (He was replaced by a QC). However, having been appointed, I think he should have “hung in there” and fought for his views. Which I am sure we can all agree seems carefully considered and entirely uninfluenced by infantilising prejudice? Maybe not. The rest of the article is similarly full of anecdote, personal opinion and exaggeration – the key tools of “rational debate”. We are told for example that: “An English friend at the Bar told me that some time ago an English trial judge, when faced with a plea of discrimination on the grounds of nationality by a German plaintiff, could not resist pointing out that one had to bear in mind that anti-German feeling and prejudice form part of Britain’s national heritage and cherished national memory” we are not given any actual evidence to support this extraordinary assertion. Indeed, anyone who can write an article calling for more rational debate and then devote the entire first paragraph to, essentially, calling an 105 year old grandmother a racist. (because she did not lose enough relatives in WW2 for his taste) Well, they are certainly in no danger of triggering any other British stereotypes about “the Foreigners”, such as those relating to irony for example. Actually, far from being an article about hostility to Germany it is pretty clear that it is actually an article about how Dr Beck would like Germany to allow the collapse of the Euro Zone…. Much like Dr Beck I have no real expertise in that field, so I won’t comment. I must also make a final comment on Hungary – Dr Beck Praises Hungary for not having a media culture of “anti-German rhetoric”. Hungary may have an enlightened media attitude towards placing german history in its proper context – but what is certain is that it today faces serious problems with both Media Freedom and Neo-Nazism. Clarkson-esque attitudes to WW2 by some pale compared to the spectre of Hungarian Jews having bounties placed on their heads by Jobbink MP’s (http://hurryupharry.org/2012/07/24/hungarian-neo-nazis-offer-cash-for-jews/) and the whitewashing of the past (http://hurryupharry.org/2012/07/07/hungary-rehabilitates-nazi-collaborators-wiesel-renounces-award/) and crackdown on media freedoms (http://www.hrw.org/news/2012/05/25/hungary-new-laws-curb-media-freedom) Hungary currently faces. Dr Beck should be in no doubt that far-right Neo-Nazism in Europe is still a powerful and malevolent force that needs to be fought against. I’m not aware of any particular ‘abiding obsession with Nazi Germany in the British media.’ It is the British media itself and the UK government who are behaving like Nazis. The former is often racist, disablist and offensive in it’s reporting; the latter is worse, adding in the severe oppression of minorities. Dark times with the lynch mob at the ballot box.